In a recent study for the California Transit Association (CTA), E3 found that electric rate structures optimal for managed, “smart” charging differ materially from those optimal for unmanaged charging. These findings can help transit agencies and utilities develop appropriate rate options that improve the economics of electrified transit. Smart charging assumes that bus charging can be sequenced, delayed, or throttled to minimize monthly bills. It is most economic under rates with highly granular time-of-use (TOU) price signals. 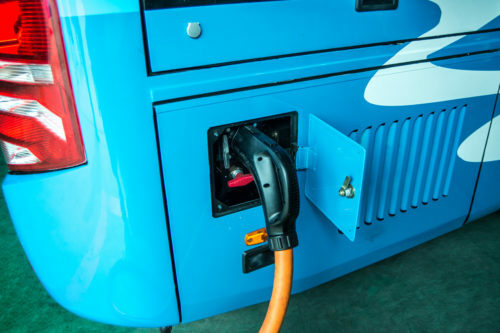 But smart charging electric buses can be difficult for many reasons, including constraints on vehicle scheduling, bus yard logistics, and charging equipment. For agencies that conduct unmanaged charging of bus fleets, a flatter rate structure significantly improves charging economics. For buses, trains, and other mass transit vehicles fueled by electricity, rate structures are a key driver of the economic proposition for transportation electrification. Understanding how rate structures impact bus fleets is increasingly important in California, where the Air Resources Board envisions transitioning the state’s transit buses to zero-emission battery or fuel cell technologies by 2040. For this project, E3 gathered extensive data from CTA member agencies to create accurate charging profiles for electric buses, which can differ considerably in terms of route lengths, charging times, and charging locations (on-route vs. depot). E3’s modeling also incorporated forecasted changes in charging and bus technologies. E3 then developed and tested a wide range of potential rate structures with various time-of-use energy charges, demand charge structures, and rate levels. Each rate was designed to be revenue-neutral to the relevant customer class and therefore a potential utility rate option. Beyond the importance of matching rate structures with actual charging behavior, E3 also found that deploying higher-capacity chargers could improve the economics of smart charging but would likely worsen the economics of unmanaged charging. CTA represents more than 200 member organizations, including all of California’s largest urban transit operators and dozens of agencies in suburban and rural areas. E3 experts Michele Chait and Lucy McKenzie conducted the study, whose findings Ms. Chait presented at the 2018 American Zero Emission Bus (ZEB) Conference. Download her presentation here.